Emojis are an effective tool to communicate emotion online and can be important to certain members. While we do not have native emojis on the platform, we have some tips to easily add emojis by adding them through a shortcut your OS already offers. 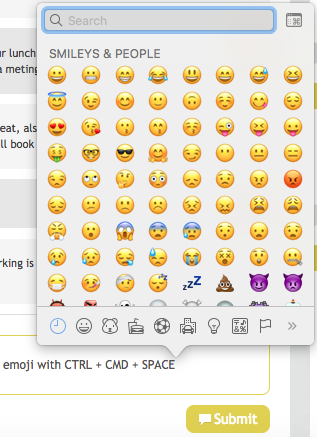 Enable an emoji window for any text field on OSX using CTRL + CMD + SPACE. Enable an emoji window for any text field on Windows using WINDOWS + . or WINDOWS + ;. Use the emoji keyboard button to access and add emojis to any text field.